Borders (BGP), the country's second-largest book retailer, posted dismal third-quarter earnings Wednesday. The company's loss from continuing operations nearly doubled to $74.4 million, or $1.03 per share, from $37.7 million, or 63 cents per share, in the same quarter a year ago. Sales totaled $470.9 million, shrinking 17.6% from the third quarter of 2009 -- a quarter that already had seen a 12.7% drop from the same period in 2008 -- and 10.5% from second-quarter sales of $526 million this year. Borders attributes the steep sales declines to the closure of 204 bookstores in the last year, including 191 smaller Waldenbooks stores. And while those closures surely played a role, the third-quarter decline was steeper than that of the last two quarters, which also had been affected by closures. The primary culprit was the gross margin from the stores that remained open: It plunged from 18.5% to 15.4%. 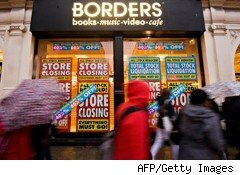 Borders blamed "the de-leveraging of fixed occupancy costs caused by negative comparable store sales." In other words, stores' sales shrunk, while their fixed costs -- things like rent, insurance and electricity -- remained the same. Comparable store sales slid by 12.6%, mainly from declines in adult fiction and narrative nonfiction. Even more troubling is the performance from Borders.com, which saw an 8.6% year-over-year sales decline to $12.5 million for the quarter, even though year-to-date sales are up 24% to $43.3 million. Borders' shrinking payroll costs (due to store closures and multiple rounds of layoffs) couldn't compensate for its increased losses. Costs from the company's digital expansion and investment in the so-called "Area E" digital shops in brick-and-mortar stores added to the carnage. Still, its digital business -- as well as its toys and games business -- brought a thin silver lining to the weak earnings report. Digital sales doubled over last year, while comparable toys and games sales grew 6.6% from the year-ago quarter. Borders stocks many more e-readers than it did a year ago, when only the Sony (SNE) reader models were available, and also beefed up its toy and game offerings in the last year. The most telling piece of news, however, is what Borders says about its future. A third party valuation "lowered the estimated liquidation value of our inventory," reducing its ability to borrow money. While the company is looking hard for replacement financing, it ominously warns that "there can be no assurance that we will be able to obtain adequate financing or that our other initiatives will be successful. If the steps that we are taking are not successful, we could be in violation of the terms of our credit agreements in the first quarter of calendar 2011, which could result in a liquidity shortfall." CEO Mike Edwards says Borders' "commitment to winning at retail is stronger than ever" and the company will "move into a new phase of the brand transformation process." But those words may not end up meaning a whole lot unless the company gets additional financing and unless its repeated attempts to attract customers with multiple rewards initiatives, more and more nonbook merchandise and a redesigned website -- one that now tends to crash at the worst possible moments -- somehow pays off.